Many visitors to this page will shake their heads with amazement wondering why on earth Jim Harbaugh would be featured as an "unforgettable player" of the Chicago Bears. The purpose of this page is to argue that Jim Harbaugh wasn't nearly as bad as we thought-and was pretty special in many ways. Harbaugh was drafted by the Bears with the 26th pick of the first round in 1987 out of Michigan. He was voted Big Ten MVP as a senior during the 1986 season, and set many Michigan records. Despite these facts, coach Mike Ditka wasn't sold. Ditka wanted to take linebacker Alex Gordon from Cincinnati, but was overruled by personnel boss Bill Tobin and President Michael McCaskey. The Bears' major downfall in their disappointing 1986 finish was the lack of a healthy quarterback. In those pre-free agency days, teams could afford to draft a player and let them develop for 4 or 5 years, which was the plan with Harbaugh. He played sparingly in 1987 and 1988, making his first start in the latter year as both Mike Tomczak and Jim McMahon were injured. He traded starts with Tomczak in 1989 before finally winning the job for good in 1990. '90 was his first breakout year, as he started the first 14 games before being sidelined with a separated shoulder. In 1991, he entered the season the club's undisputed starter, an put up numbers unseen by a Chicago team in years. In '91, Harbaugh set Bears records for attempts and completions, and fell just 55 yards short of the team's single season record for passing yardage. He was the first Bears quarterback to start all 16 games since Vince Evans in 1981. There were 2 major highlights for Harbaugh in 1991. Against the Jets on Monday Night, he threw for 303 yards and spearheaded the team's come-from-behind overtime win. And against New Orleans, he was terrible for the first 3 and a half quarters, and was about to be pulled for backup P.T. Willis. But with less than a minute left in the game, he threw several strikes to Wendell Davis and Neal Anderson, and beat the undefeated Saints with a TD pass to Tom Waddle. Pulling out tough games like this takes leadership, an intangible posessed by the tough-as-nails QB. Harbaugh's leadership never shined brighter than on opening day, 1992. Chicago was hosting 1991 division champ Detroit, and the game was even at 17-17 with just over a minute left. Harbaugh drove the Bears down the field, completing the game-winning touchdown pass to Tom Waddle with 1 second, and no timeouts, left. With such a miracle opening to the season, many expected the team to do big things for the remainder of the season. It didn't happen. After beating Detroit, the team was beaten badly by New Orleans and the New York Giants. They then defeated Atlanta behind a fine Harbaugh performance. The Bears then marched into Minnesota and held a commanding 20-0 lead in the middle of the third quarter. Then it happened-the play that would basically end Harbaugh and Ditka's careers in Chicago. The Bears faced a third-and-short inside their own 30 yard line. Despite the horrific noise in the Metrodome, Harbaugh called an audible at the line of scrimmage. Apparently halfback Neal Anderson didn't hear it called, and he failed to break off his pattern into the flat as the quarterback had called it. Harbaugh threw a short pass into the flat, and CB Todd Scott intercepted it & took it in for the touchdown. Mike Ditka threw an absolute temper tantrum on the sideline, and less than a quarter later, Minnesota won the game 21-20. Unfortunately, Harbaugh will be remembered more for the ill-fated audible against Minnesota that sealed Mike Ditka's fate, than for any of his miracle finishes. Harbaugh played one more season for the Bears in 1993. New coach Dave Wannstedt decided he needed a quarterback with a stronger arm and quicker reads than Harbaugh, and brought in Erik Kramer from Detroit. Harbaugh went on to lead Indianapolis to within a hail-mary pass of the super bowl in a brilliant 1995 campaign. During that season, Harbaugh made his first Pro Bowl and led the NFL in passer rating. Harbaugh will begin his 15th season in 2001, still posessing the toughness & versatility that brought him into the league. As of 2005, Jim Harbaugh still has thrown for the second most yards in Chicago Bears History (11567, second to Sid Luckman). He still leads the franchise in most attempts (1759) and completions (1023). Harbaugh was named UPI's Big Ten MVP following his senior season at Michigan. He became the first passer there to throw for more than 2,000 yards in a season, and finished with a QB rating of 157.0. Still, there was dissention in the Bears' draft room over selecting him. He started his first game in 1988, split time with Mike Tomczak in '89, and became the team's full-time starter in 1990. 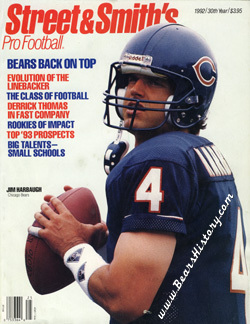 In 1991, he became the first Bear quarterback since Vince Evans to start all 16 games in a season. From 1990-1992, Chicago found itself consistently coming up short in games, and often Harbaugh took the blame from fans. However, the quarterback set a Bears record by throwing 173 straight passes without an interception in 1990. The tirade Mike Ditka threw on the sidelines at Minnesota in 1992 was directed at Harbaugh, and it effectively ended the team's chances that season. Prior to the 1993 season, Harbaugh was signed to a five-year, $15 million contract at the dawn of free agency. He would be out of Chicago following that season. Harbaugh is currently (2005) Head Coach at the University of San Diego.